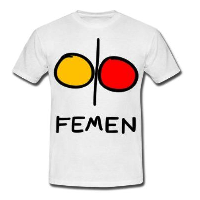 The women of the activist group FEMEN use the female body as a weapon, not an object. What began with a few protests in the Ukraine has spread across the globe, wherever the powerful meet and the media gather to cover them. They were at it again at the most recent World Economic Forum in Davos, purposely getting themselves man-handled by beefy security guards. VOCATIV caught up with them a few weeks earlier, as they trained a group of able-bodied, new recruits in Paris. This entry was posted in English, Ukraine on January 29, 2013 by FEMEN.